Among the new men's fashion trends for winter here are the stylish "Sloane Square" handmade boots by GuidoMaggi. The upper in black shiny calfskin leather, is hand punched to get the characteristic English "Brogue". The "Sloane Square" feature the extreme comfort and durability of their innovative tank thread outsole, super lightweight, made of 100% natural rubber. 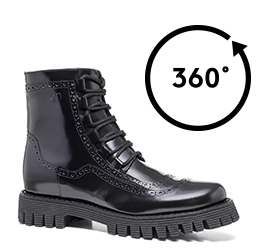 This boots are able to give an increase in height of 2.4, 2.7, 3.1 or 4 inches.